The DofE is the world leading youth achievement award and has been available to young people aged 14-25 for over 60 years! The DofE scheme has grown successfully over the last six years at Sandhurst School and we are now in a position to offer every student the opportunity to take part. The award is a fantastic opportunity for students to develop their independence, teamwork and leadership abilities. These skills are highly regarded by education institutions and employers. The scheme requires persistence, personal resilience and commitment, in order to successfully meet the challenge of the award. We run the Bronze and Silver award at Sandhurst School and work with a specialist approved activity provider to deliver training and expedition logistics. Inspired Expeditions (www.inspiredexpeditions.co.uk) are organising our Bronze and Silver training, practice and assessment expeditions. 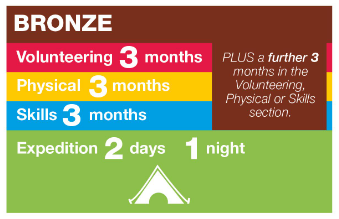 We are offering the Bronze award to all year 9 students and there is no longer an age limit, therefore they can start at the beginning of the academic year. We are offering the Bronze and Silver award to year 10 students. The bronze award is not a prerequisite. 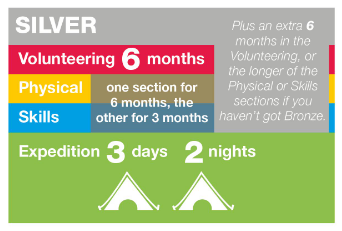 Although students will have regular meetings with our DofE Manager Mrs Sharpe to receive support, we would like to remind you that, as this is an extra-curricular activity, we expect students, as well as parents / carers, to ensure that the different sections are completed and they are done so on time and we expect all participants to abide by the DofE 20 Conditions during their expedition section. These can be found here. You can find useful information on the DofE website or on the edofe website, or on the DofE’s YouTube page. You can also contact Sandhurst School’s DofE Manager, Mrs Sharpe at bsharpe@sandhurst.bracknell-forest.sch.uk.